Denmark. 3 Christmas Card With Seal/Stamps 1979-1980-1981. Santa,Bear,Ducks. 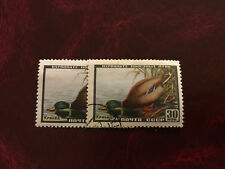 Yugoslavia fauna-ducks in pairs 1989 USED. The complete series. GOOD condition. At the good price. 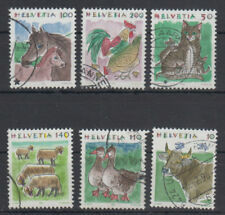 I have been a stamp collector for sixty years. We love this hobby of stamp collecting and promote it whenever possible. 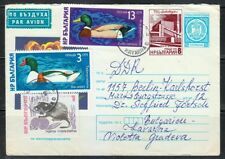 Soviet-Union 5965-5967 (complete issue) fine used / cancelled 1989 Ducks and Geese. Title: 1989 Ducks and Geese. Descripcion: Ducks and Geese. Area: Soviet-Union. Quality: fine used / cancelled. Soviet-Union 6099-6101 (complete issue) fine used / cancelled 1990 Ducks. Title: 1990 Ducks. Descripcion: Ducks. Area: Soviet-Union. Quality: fine used / cancelled. IRELAND - 1548a - S/S - USED (FDC) - 2004 - DUCKS. Condition: WORN CORNERS SOILED. Item ID: jjz_2071. Any existing faults will be fully described except those that are readily apparent from the photo, such as missing perforations, heavy cancels, etc. Condition Used. 12,00 EUR catalog price, according Michel N-Europa 16/17.